Students and staff of Concordia University participated in Concordia’s 27th annual Concordia Shuffle— a 6.5 km walk from the Sir George Williams campus to the Loyola campus aimed at raising money for student bursaries and scholarships. Shufflers gathered at Loyola to be welcomed to the President’s Picnic. Photo by Alex Hutchins. Concordia University News reported Concordians raised $65,000 during the shuffle for student bursaries and scholarships last year. Shufflers arriving at Loyola campus. Photo by Alex Hutchins. 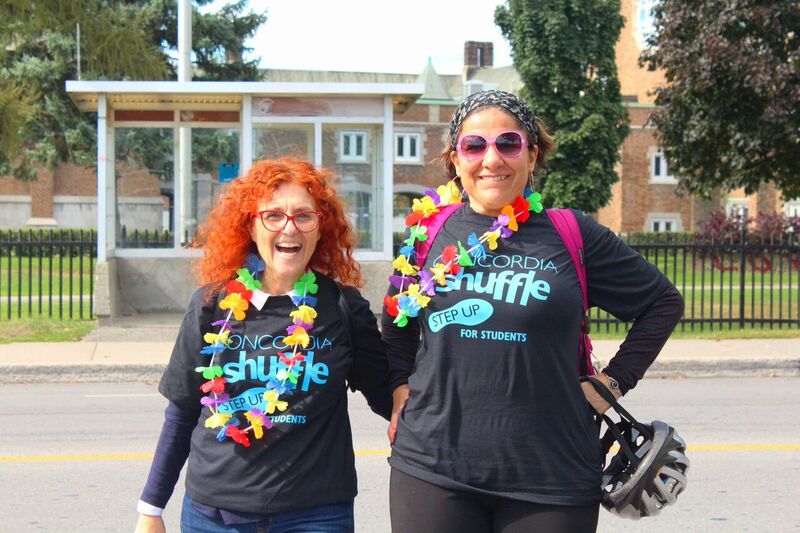 Participants can also bicycle, run or rollerblade during the shuffle, said Faye Corbin, a Shuffle volunteer and a member Concordia’s library staff. “This year we have a group of people who are using the Bixi [bikes], and [their group] actually donated bixis for the event,” she said. Students must raise a minimum of $25 to participate, and for faculty and staff it’s $40, said Corbin. She added that people can gain sponsorships from family, friends, professors or even by sponsoring themselves. Shufflers pose at the President’s Picnic. Photo by Alex Hutchins. “With the minimum sponsorship, they get the shuffle kit, which [includes] a T-shirt. This year, it also [comes with] sunglasses with a few passes to restaurants, yoga and Le Gym,” said Corbin. At the end of the walk, participants were welcomed with the “President’s Picnic” at the Loyola campus, where they were greeted with food and prizes. Shufflers refuel after their 6.5 km from SGW campus to Loyola campus. Photo by Alex Hutchins. “We always try to do the best we can and surpass the previous years,” said Valerie Roseman, organizer of the 27th shuffle and development officer of community programs. She said there was no set goal for how much money the Shuffle aimed to raise this year.